Have you reviewed the Camp Registration Guide? Great – Click on the camp below you want to register for OR visit the Event Registration Page to choose the camp you wish to register for. Email Michael To Ask About Space to Register Your Group. Outdoor Ministry is a defining characteristic of the missional ministry that the Christian Church (Disciples of Christ) offers to children, youth, and adults. Often people will think of Outdoor Ministry as “summer camp” only, but our Region’s Outdoor Ministry includes weekend retreats, traditional residential week long camps and non-traditional week long camps that give children, youth, and adults of all ages the opportunity to play, pray, worship, study, and serve one another and new neighbors. Outdoor Ministry is one way we teach the language of faith, and the practice of Christianity for the Church today and tomorrow. In Oklahoma there are three camp facilities that have Disciples roots dating to the early 1950’s. These facilities remain related to Christian Church in Oklahoma. Each one, Camp Christian, Texoma Christian Camp, and Central Christian Camp & Conference Center have their own governing boards that set policies, rental fees, and maintain onsite staff and programs. The Christian Church in Oklahoma has no oversight, nor financial responsibility for these facilities. One of our Associate Regional Ministers attends the board meetings of the facilities and provides support and advice when needed. Many individual members and congregations provide their time and financial support to one of our Disciples related facilities. Great question. The design of our outdoor ministry is based in small groups that provide intimate space for campers to learn how to listen and talk to others. Campers spend time each day with their small group, and within the whole community they participate in art projects, they hear and interpret bible stories, worship together, and of course there are games, singing, sports, and pool time. Chi Rho and CYF campers are also offered workshops that teach life skills. Some recent workshops have focused on Internet safety, budgeting, photography, car maintenance, first-aid, and relationships. Designed for children who have completed grades 2-3. This weekend camp introduces children to living in intentional Christian community. Designed for younger youth who have completed grades 4-5 and lasts a week. Designed for youth who have completed grades 6-8 and lasts a week. Designed for youth who have completed grades 9-12 and lasts a week. Designed for Grandparents and a child that has completed grades k-4. This two night-three day experience will give grandparents and grandchildren the opportunity to share family stories and faith stories. We send a small number of youth to the Heifer Ranch in Perryville, AR to learn about other cultures through their Global Village program. Some years during Spring Break we offer a two-night three day trip to the Heifer Ranch for a short program in the Global Challenge. A study trip to Washington DC and New York City designed for youth in grades 11-12. Accompanied by adults, the youth study a topic relevant to both our culture and faith while taking in the sites and sounds of these two major East Coast cities. When is summer camp schedule published? We publish the summer camp schedule for the upcoming year during the fall the year before. In late January each year you can download the “Camp Guidebook” from this website. This publication will help you know how to register, what forms are needed, costs, and answer many of your questions. What does summer camp cost? The summer camp rates are set each January/February before the coming summer season. The rates cover the cost of the site fee, t-shirt, adult volunteers, insurance, lodging, meals, supplies, and program expenses. We offer a “discount rate” for those who register for camp between February and April 16 and “regular rate” for those who register for camp between April 17 and May 17. Where do I find publicity and info about camp dates and fees? 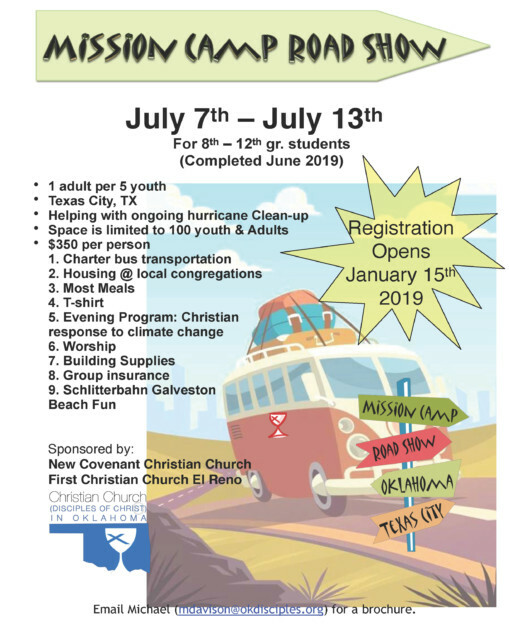 Summer Camp dates, along with all other program ministries for children, youth, and young adults, are published on this website as well as on the CYYA Ministries Facebook page, and the CYYA Intersection. Are you a subscriber to the CYYA Intersection? This monthly e-News will keep you up to date with opportunities, events, resources, and stories about ministry with Children, Youth, and Young Adults in our Region. Do you need adult volunteers? YES! Please contact Michael Davison. I’d love to talk with you about adult volunteer experiences at our camps. A monthly eNews, the CYYA Intersection arrives to your inbox containing stories, resource links, news, and connection points to other Disciples. The CYYA offers a variety of opportunities throughout the year for persons ages K-35 years old. CYYA Ministries in Oklahoma are evolving and growing into a future that includes age appropriate experiences and events beyond the summer months for our diverse age bracket. We need two things: adult volunteers and funding. Our summer camp directors are always seeking adults to be counselors. As our opportunities expand we will need a variety of adults with different skills to make these opportunities a reality. The other major need is funding. Each young person attending a summer ministry experience helps pay for the adult volunteers for that week. This fee is added to the camper fee and is based on the number of campers who attend and the number of adults needed. Funds raised for Summer Ministry could lower the cost for everyone that attends a camp in the future no matter where it may be hosted. Please consider a gift to support Summer Ministry and help us create funding to support this ongoing program ministry of the Region. Are you considering a “legacy gift” to fund a ministry in your congregation or through the Region? The Oklahoma Disciples Foundation does this kind of work to support ministries throughout the Disciples of Christ in Oklahoma. Make your check payable to Christian Church in Oklahoma, and note in the memo line what program ministry you are supporting. Mail To: 301 NW 36th Street / Oklahoma City, OK, 73118. Please indicate IAS, Youth Ministry, Children’s Ministry, Young Adult Ministry, Heifer Week, or Summer Ministry in the memo line. Thank You, Thank You, Thank You! Contact Rev. Michael Davison for more information about how you can support these missional ministries. Visit our homepage to donate Online. Choose “Youth Ministry” from the dropdown box. In the “Special Instructions” box type which experience you want to support.